The John Deere L110 lawn tractor features a 17.5-horsepower Kohler engine, a hydrostatic transmission with twin touch pedals and a 42-inch mower deck. The governor controls the speed of the engine during operation. If the governor becomes maladjusted, the engine will operate erratically. You can easily adjust the governor in a few minutes, using a few basic tools. 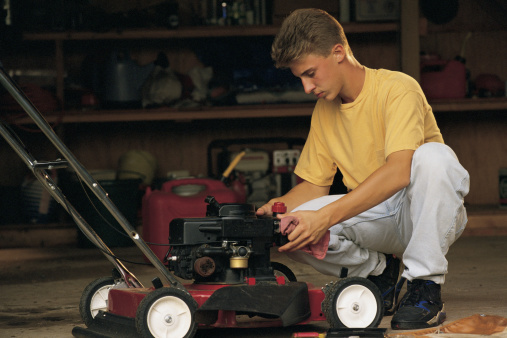 Park your John Deere L110 lawn mower on a hard, level surface and set the parking brake. Push the throttle lever to the full throttle position. Raise the hood. Locate the throttle linkage on the left side of the engine, directly in front of the oil filter. Follow the governor rod, which goes through the throttle linkage and protrudes from the side of the engine block. Loosen the nut just below the governor rod, using the 10 mm wrench. Push the linkage connected to the governor rod all the way forward toward the carburetor. Turn the governor rod counterclockwise until it stops, using the needle-nose pliers. Hold the governor linkage in the forward position and tighten the nut below the governor rod.